Tuesday: All three players have cleared waivers and can be assigned to the minor leagues. Monday: With the Edmonton Oilers continuing to slip out of playoff contention, the team has placed forwards Ty Rattie and Ryan Spooner on waivers. They’ll be joined by Justin Falk of the Ottawa Senators, who is finally healthy enough to resume playing but will be sent to the minor leagues if he clears. Spooner’s placement on waivers will be the one that dominates headlines for the next 24 hours, given how he came to be part of the Oilers organization. The 26-year old forward was acquired from the New York Rangers for Ryan Strome earlier this season, who in turn had been the entire return for Jordan Eberle when the Oilers felt they needed to shed some salary up front. The idea that Spooner could now be gone for nothing will enrage Edmonton fans that have watched Eberle find success with the New York Islanders while their team struggles to find anyone who can put the puck in the net outside of their top three. The Oilers have even been described as desperate to add offensive touch on the wings, something that basically describes Eberle (not to mention Taylor Hall, another traded winger) perfectly. Still, it’s not really surprising that Spooner finds himself in this position. The forward has recorded just three points in 24 games since being acquired by the Oilers and has recently spent time in the press box as a healthy scratch. His perimeter game has not gelled with head coach Ken Hitchcock’s system at all, and without regular powerplay time his offensive production has almost completely dried up. There may be some reason to believe Spooner will be claimed though, given his history as a 40-50 point center in the league. In 2015-16 with the Boston Bruins Spooner recorded 49 points in 80 games while playing more than 15 minutes a night, before settling for 39 and 41 points the next two years while playing on the wing more often. That kind of production is exactly what the Oilers were hoping for when the acquired him, and what another team could take a chance on. With one more year on his contract at $3.1MM though, Edmonton may be forced to try and bury him in the minor leagues for the time being to open up some cap space. Rattie meanwhile was likely one of the people most upset when Hitchcock was given the Edmonton job, given their history with the St. Louis Blues. The 32nd-overall pick from 2011 was never really able to get into the lineup under Hitchcock, and eventually found himself claimed off waivers by the Carolina Hurricanes. In 30 games with the Blues, Rattie recorded eight points, the same number he has in 29 contests with Edmonton this year. Sunday: The Oilers announced they have placed Rattie on injured reserve. The team has recalled Cooper Marody from the Bakersfield Condors of the AHL to replace him on the roster. The Oilers acquired Marody’s rights from Philadelphia in March and were able to sign him away from the University of Michigan. The 21-year-old already has two goals and six points in the Condors first five games. Saturday: The Edmonton Oilers announced that Ty Rattie, who was forced to leave Thursday’s game against Boston with an apparent injury, will be without the promising winger for a couple of weeks with a muscle injury in his midsection. The 25-year-old winger made a name for himself in the preseason when he led the league in goals with seven. That string of performances won him a spot on the team’s first line next to Connor McDavid and Ryan Nugent-Hopkins, but Rattie has not been able to continue his goal-scoring streak into the regular season. He has a goal and an assist in five games. The injury is a big blow to a player who has been working hard to earn a full-time role in the Edmonton lineup. He has played 54 games in the NHL, but spread out over six seasons. The Oilers intend to promote 2017 first-round pick Kailer Yamamoto to the top line while Rattie is out. The fast-skating 20-year-old has a goal in five games, but if he can find some chemistry with McDavid as many people have predicted could happen, that could end Rattie’s time on the first line, one of the best lineup opportunities in the NHL. The Edmonton Oilers are set to make some changes on the back end, at least for the time being. The team announced today that they have placed defenseman Matt Benning on the injured reserve. The nature of Benning’s injury has not been disclosed and the team gave no timeline for a return, but the injury did occur in last night’s game against the Boston Bruins and his IR assignment means Benning will miss at least ten days and the Oilers’ next five games. In a corresponding move, Kevin Gravel has been recalled from the AHL’s Bakersfield Condors. Benning’s injury is somewhat ironic. The 24-year-old blue liner was actually the aggressor on a questionable hit up high on Boston forward David Backes early in Thursday night’s 3-2 overtime win for Edmonton (video). Benning received neither a penalty nor a second look from the league on the hit, which sent Backes to the locker room for the the remainder of the period. Backes returned later on, yet it was Bruins draft pick Benning ruled out not long after with an undisclosed injury. Now, Benning lands on the injured reserve even though he nearly landed a serious head shot on Backes. It is worth noting that Benning, teammate Ty Rattie, and Bruins defenseman Kevan Miller all left last night’s chippy contest. Benning’s absence will allow free agent addition Gravel the chance to re-establish himself at the NHL level. A signing from the Los Angeles Kings, Gravel fully expected to have a role in Edmonton to begin this season. However, the emergence of rookie Evan Bouchard and a successful tryout from veteran Jason Garrison forced Gravel down to the AHL to begin the year. A physical, stay-at-home defender, Gravel has skated in 70 NHL games over the past three seasons and contributed 93 hits and 84 blocked shots as a gritty presence on the back end. The 26-year-old brings a different skill set from Benning, but should provide an edge and a solid game in his own end for the Oilers while he replaces his injured teammate. A strong showing could earn Gravel a long-term stay in Edmonton. It’s easy to forget that non-playoff teams are still hard at work behind the scenes, but the Edmonton Oilers have thrown their name into the postseason news cycle this evening. The team announced that they have re-signed forward Ty Rattie to a one-year contract extension worth $800K. Rattie was an impending unrestricted free agent, having signed a one-year deal with Edmonton last off-season. Rattie must be relieved to have his contract situation wrapped up and to be returning to Edmonton next season. The 2016-17 experience was not an easy one for Rattie; the swift-skating right winger played in four games with the St. Louis Blues early in the season, was waived and claimed by the Carolina Hurricanes in January, was waived again a month later after just five games in Raleigh, and claimed back by the Blues who buried him in the AHL for the remainder of the season. Rattie was then not given a qualifying offer last summer, making him an unrestricted free agent. Rattie settled for a one-year, two-way deal with the Oilers, but made the most of it, scoring a career-high nine points in 14 games while also earning an AHL All-Star nod, finishing with 43 points in 53 games. This extension will represent a substantial raise over his last deal with the Oilers. After an impressive campaign at both levels, the 25-year-old looks primed to fight for a full-time role in Edmonton next season. While he is likely happy to be back with the team that gave him the best chance to succeed thus far in his young pro career, Rattie – and the Oilers – must have known that he could have drawn some interest on the open market as well. Instead, there was clearly mutual interest in maintaining the status quo. Ty Rattie is back with the Blues. After getting waived by the Hurricanes yesterday, the right winger has been claimed by St. Louis (via Sportsnets’ Elliotte Friedman on Twitter). The 24-year-old originally joined the Carolina organization after being waived by the Blues earlier this season. Jeremy Rutherford of the St. Louis Post-Dispatch tweets that Rattie will likely land in the AHL. The 2011 second-round pick ultimately played in five games with the Hurricanes, compiling two assists and averaging 13:28 of ice time. During his previous stint with the Blues this season, Rattie didn’t collect a point in four games. The forward has played in three AHL games this season, although he did collect 17 goals and 29 assists last season with the Chicago Wolves. Rattie is making $650K this year and will be a restricted free agent this summer with arbitration eligibility. Meanwhile, the Sabres waived blueliner Taylor Fedun yesterday, and Friedman tweets that the 28-year-old has cleared waivers. The team announced that he’s be assigned to the Rochester Americans. Right winger Ty Rattie finds himself back on the wire as the Hurricanes announced Saturday that they have placed him on waivers. It’s the second time he has been waived in 2017 as Carolina picked him up via waivers from St. Louis back in early January. Since being claimed on January 4th, the 24 year old played in just five games with Carolina, picking up two assists while averaging 13:28 per game. However, he was also a healthy scratch 12 times in that span. On the season between the Blues and Hurricanes, he has two assists in nine games while logging 10:44 per game in ice time. In his career, he has five goals and five assists in 35 games. Rattie is making $650K this season and will be a restricted free agent this summer with arbitration eligibility. Rattie wasn’t the only player put on waivers on Saturday as the Sabres placed blueliner Taylor Fedun on the wire per Sportsnet’s Chris Johnston (Twitter link). The defenseman has played in 25 games with Buffalo this season, picking up seven assists while playing a little under 14 minutes per night. He has been a much bigger offensive threat at the minor league level, recording 17 points (4-13-17) in just 20 games with Buffalo’s AHL affiliate, the Rochester Americans. Buffalo activated fellow rearguard Cody Franson off of injured reserve earlier today, leaving Buffalo with eight defensemen in the active roster. Fedun carries a cap hit of just $600K and is slated to be an unrestricted free agent in July. Still with the waiver wire, Devils center Sergey Kalinin cleared, reports Andrew Gross of the North Jersey Record (Twitter link). He has been assigned to their AHL affiliate in Albany. In his latest chat feature appearing in The St. Louis Post-Dispatch, Jeremy Rutherford tackles an array of reader questions yesterday. A popular topic for Blues fans are the ongoing struggles of center Jori Lehtera, who St. Louis made a healthy scratch for this evening’s game against Winnipeg. Lehtera posted a strong rookie campaign in 2014-15, finishing with 14 goals and 44 points in 75 games. He followed that up with a 34-point campaign last season, a noticeable drop off in output but still enough to convince the Blues to ink the 28-year-old Finnish pivot to a three-year deal with an AAV of $4.7MM. As Rutherford noted, the Blues might have been better off waiting another year to prove himself but the team decided to get that deal done so as to allow themselves to focus on re-signing David Backes and Jaden Schwartz. With just seven points in 20 games this season it’s looking like that extension may have indeed been premature. Rutherford also believes it’s more likely now that the team will leave Lehtera unprotected and available to be taken by the Vegas Golden Knights in next June’s expansion draft. He projects the Blues will choose to protect 10 skaters – seven forwards and three blue liners – but has Lehtera and Ty Rattie as two the team will leave unprotected. Mike Russo of the Star Tribune reports that Zach Parise is indeed healthy, according to the team’s bench boss, Bruce Boudreau. There was concern after the veteran winger blocked a shot in the first period of Minnesota’s recent loss to Calgary. Boudreau described Parise’s skating as “sluggish” and “methodical,” in post-game remarks, which led to the questions pertaining to Parise’s health status. The long-time NHL coach did sit down with Parise along with winger Charlie Coyle, and plans to do the same with center Eric Staal to discuss the line’s recent struggles. As Russo notes, the line is pointless in its last two contests and the trio combined for just two even-strength shots in the Calgary game. Lastly, Colorado GM Joe Sakic is sticking by the team’s core group despite a rough start to the 2016-17 campaign, writes Terry Frei of The Denver Post. The Avalanche are currently tied with Arizona for last place in the Western Conference and are seven points out of a playoff berth. With their season on the verge of slipping away, Sakic still expresses faith in his core – Matt Duchene, Gabriel Landeskog, Semyon Varlamov, Tyson Barrie, Erik Johnson and Nathan MacKinnon – and feels the team needs to play with more urgency in order to get their season back on track: “I have faith in them. But to me, the start is not a core thing; it’s a team thing. I think you see we’re trying to hold people accountable. We know we have certain guys who can give more, and those guys know they can give more, but it’s not like it’s a whole thing. We’re not as consistent as we need to be. We didn’t win two straight Cups and have that leeway. We have to play with that urgency every night on a consistent basis to be successful.” Sakic’s reluctance to break up the team’s core played at least some part in the division between the GM and former head coach Patrick Roy. Unless the Avalanche can turn things around relatively quickly, it’s going to look like Roy, and not Sakic, was correct in his assessment. With 14 NHL-caliber forwards on the roster it’s proven to be a challenge at times for St. Louis Blues head coach Ken Hitchcock to find playing time for everyone. In fact, Ty Rattie, once the 32nd overall pick in the 2011 draft, has made just one appearance for the Blues, playing just eight minutes in an OT loss to Vancouver on October 18th. The inactivity prompted the team to send Rattie down to Chicago just to get him some game action. Today the team recalled the 23-year-old right wing from the AHL. The Blues obviously still see potential in Rattie as evidenced by their refusal to expose him to waivers and risk losing him to another club. 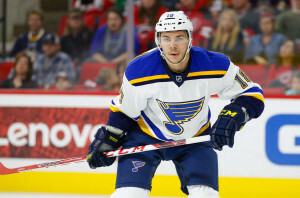 Still, the clock has to be ticking for Rattie on his Blues career and if he doesn’t impress the coaching staff at some point in the near future, it’s possible the team will finally choose to move on. 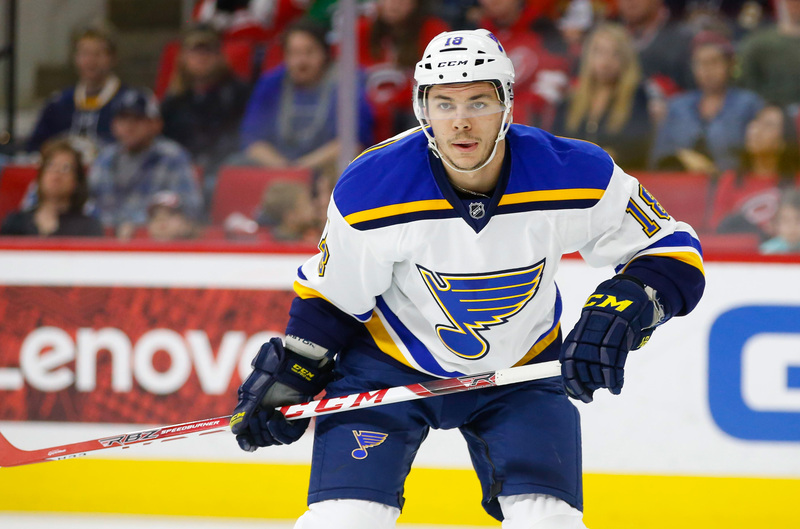 Given the Blues roster situation and barring an injury to a top-nine forward, it doesn’t appear as if there’s a clear path to playing time in St. Louis. Rattie has put up good numbers in the AHL, tallying 69 goals and 137 points in 196 games in Chicago. But he’s had limited chances in the NHL, seeing action in just 27 contests and averaging 9:18 of ice time. His junior pedigree suggests he has the talent to succeed at this level and perhaps only needs an extended opportunity with another team. The St. Louis Blues have re-signed forward Ty Rattie to a one-year, 650K deal tweets Norm Sanders. The Blues also announced the deal this afternoon. It is a one-way contract. The 23-year-old forward spent 62 games with AHL affiliate Chicago, registering 46 points (17-29). Barrie played in 13 games in St. Louis, notching six points (4-2). Rattie has a total of 26 games at the NHL level and posted eight points (4-4). With the signing, the Blues have just over $8.7MM left in salary cap room. Only Jaden Schwartz remains unsigned. His arbitration date was recently set for July 20.